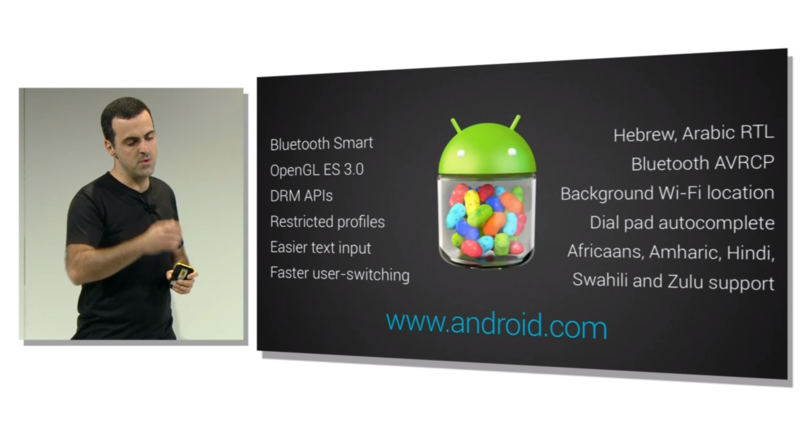 Google has finally put to rest all the rumors of their new OS Android 4.3 at their breakfast event in San Fransisco yesterday. Android 4.3 is still Jelly Bean for those who were expecting it to be Key Lime Pie, so it may be safe to say that Android 5.0 could actually be Key Lime Pie. Lets look at Android 4.3 Jelly Bean for now, the update comes with a lot of under the hood tweaks , which means that there are no visual changes as such for the everyday user. The firmware has already started rolling out for users of the Galaxy Nexus, Nexus 7 and Nexus 10 via OTA updates. The Google Edition Samsung Galaxy S4 and HTC One will get the update “soon” according to Google. Android 4.3 does come with an upgrade camera software as well, Google did not mention it at the event but we know thanks to the leaked GE Galaxy S4 system dump. Google also updated a bunch of Google apps, such as Gmail, Hangouts, Keep and even the Play Store has been updates for multi-player gaming. If you can not wait for the OTA update then you can manually update your device directly from the Google Developers website.